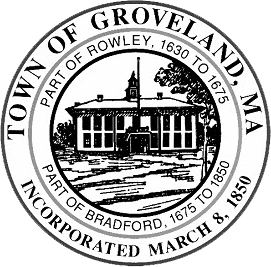 GROVELAND — Finance and Personnel Director Denise Dembkoski is pleased to announce that the Town of Groveland has a new Highway Superintendent, Renny Carroll. Carroll replaces long-time Road Commissioner, Robert Arakelian. Arakelian was elected as the town’s Road Commissioner in 1995, and retired this past November. Since then he has worked part-time as the town has searched for a new person to take on the role. Carroll’s first day as the town’s appointed Highway Superintendent was Monday, March 18. As the town’s Highway Superintendent, Carroll will perform all of the administrative, technical, and supervisory work duties of the Highway Department. The position includes the planning, evaluation, organization, and management of all highway maintenance and construction, engineering, street projects, snow and ice removal, vehicle maintenance, sidewalk projects, and parks and grounds maintenance. Most recently, Carroll served as the Highway Supervisor for the City of Portsmouth, New Hampshire. Carroll’s responsibilities in Portsmouth included supervising and training skilled and semi-skilled workers, overseeing the Paving and Maintenance Division, interviewing and hiring new employees, snow removal and operations, overseeing road repairs and being in charge of the paving/maintenance program. He worked for the city for approximately one year. From 2009 to January 2018, Carroll also previously worked as a foreman/supervisor for the City of Beverly, where his duties also included overseeing the Paving and Maintenance Division, training new hires, snow and ice operations and overseeing road repairs, among other responsibilities. For four years, Carroll served as a driller’s assistant/safety officer for Boart Longyear, a mining and drilling services and equipment company. He also worked for nine years as a job site foreman for Carroll Asphalt Paving. Carroll holds several qualifications and licenses, including a Class A commercial driver’s license, 2B/1C hydraulic hoisting license, waste water operator’s license grade 3, and asbestos pipe cutting certification. He is also confined work space trained and an experienced diesel mechanic. GROVELAND — Finance and Personnel Director Denise Dembkoski is pleased to announce that the Town of Groveland has been awarded a $15,000 Massachusetts Downtown Initiative Technical Assistance Program Award. The $15,000 grant will fund consulting services to assist the town as it reviews the economic conditions of the Elm Square area and assesses the potential for new business. Town Planner Rebecca Oldham spearheaded the town’s application for the grant, and will oversee the Elm Square initiative. Oh Thursday, Feb. 7, Dembkoski and Oldham attended an award ceremony at the Topsfield Town Hall at 8 West Common St., Topsfield. The grants were presented by Lt. Gov. Karyn Polito and Department of Housing and Community Development Undersecretary Janelle Chan. At the ceremony, $300,000 in grant funding was awarded to representatives from 20 communities to pursue downtown initiative projects.